Nantucket Lightship Baskets are distinctive handmade baskets originating over 150 years ago. They were first created by the crewmen of lightship vessels, as a way to pass the time at sea. 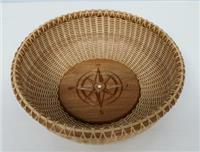 The Nantucket Basket's labor-intensive construction is characterized by several distinctive features. 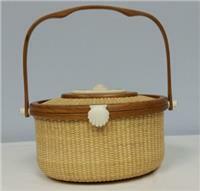 They are hand woven using rattan or cane onto wooden molds with wooden bases. The Nantucket handbags are decorated with carved or scrimshaw pieces. Nantucket Basketworks of Cape Cod features authentic, finely hand woven Nantucket Lightship Baskets by Lisa Bessette. They are custom made to your specifications. Over the years, we have received several awards for our handcrafted baskets, purses and tote bags. Our baskets have been photographed for The New York Times magazine, Vanity Fair, Brilliant Magazine and O, The Oprah Magazine. 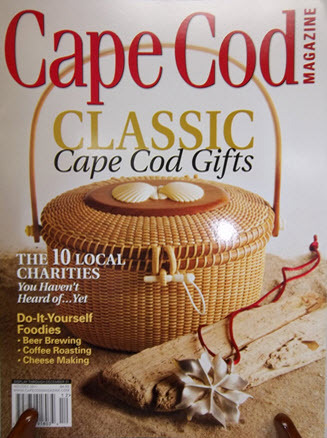 Lisa and her baskets were featured in Cape Cod magazine. Your authentic Nantucket Basket will be made to order using only the finest quality materials available, and it is guaranteed to last a lifetime. All of our baskets are signed and dated by Lisa Bessette. Feel free to browse around and look at our unique Nantucket-style purses and tote bags. Our woven handbags and purses come in a variety of shapes and sizes, so we're sure you'll find one to fit your needs. Please allow 12 weeks for delivery. Lisa's baskets can now be found in fine shops on Cape Cod . See her beautiful work at Oceana in Orleans MA. New location! 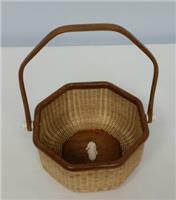 The baskets are now for sale at FabVilla in Mashpee Commons in Mashpee, MA. © Nantucket Basketworks. All Rights Reserved.